They are designed to slip over the top of the crucible to just below its widest point when the crucible taper in. When the handles are closed the crucible is cradled securely for removal from the furnace whilst ensuring that the crucible does not slip through. 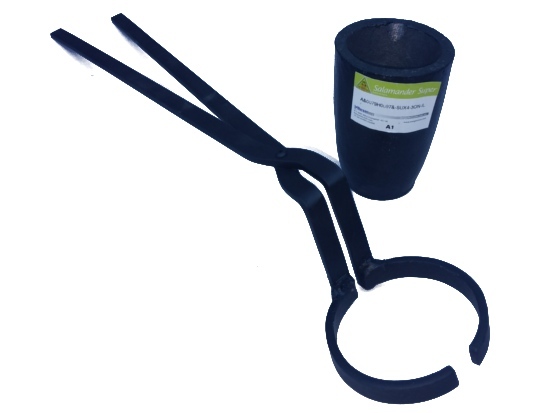 For larger size crucibles a lockng mechanism of a hoop or loop is fitted to prevent inadvertent opening of the handle is employed to prevent the crucible sliping out when lifting. Like all foundry tools they should be preheated to drive off moisture and prevent chilling of the crucible. The use of full Personal safety equipment is essential when used. Dependant upon user strength and safety issues dual ended lifting versions are available. These are usually for the larger crucibles.